Watermelon has left the building! I realize I'm behind on posting this. Most people have moved on from watermelon and summer fruit to pureeing and preserving pumpkins. I searched the farmers market in vain this weekend for more watermelon. 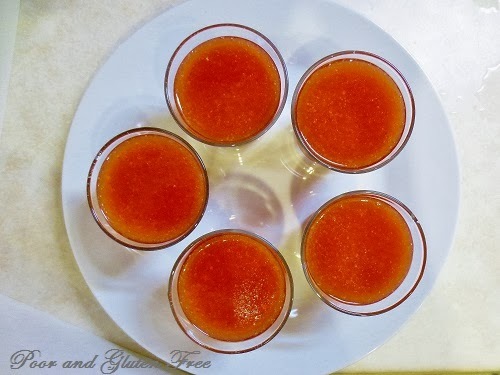 But just over a week ago I shared a super frugal recipe for Watermelon Rind Soup, and I promised I would share another cooked watermelon recipe. So this week I'm posting this funky pink pudding - Sicilian style. If you look hard enough, you can probably still find some watermelon so you can enjoy this on a sunny fall day. 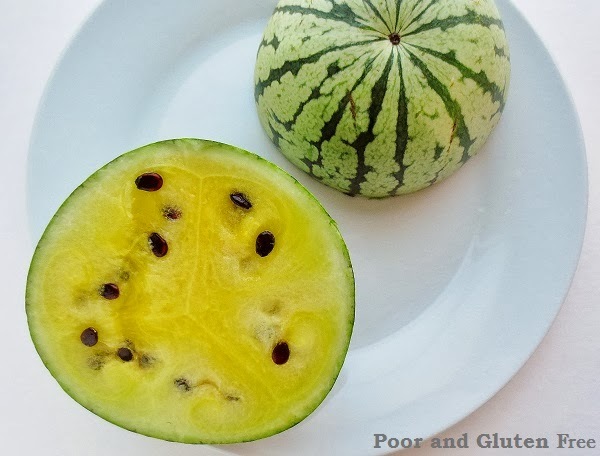 As I mentioned in my last watermelon post, I'm allergic to melons, thanks to Oral Allergy Syndrome, a hay fever related autoimmune disorder that causes allergies to pollen-related foods. Melons make my tongue itchy, and, while cutting up my watermelon last week, I discovered they make my fingers numb and tingly, too! Fun stuff. BUT I can have cooked melons, because the heating process helps destroy the allergen proteins, making them safer to eat. I really wanted a pink pudding. I don't use artificial colouring. Why? * It's not food. It's literally called artificial. You wouldn't eat artificial plastic food, so why eat artificial food colour? * It comes with a # sign after it. * In Europe, food dyes have been removed from food. Europe is smart, most countries there have banned GMOs. That's one of the benefits of public health care, the government doesn't want you to get sick because it will cost them more. So how to naturally dye my yellow pudding pink? Traditional Sicilian watermelon pudding calls for cornstarch and 1 cup sugar. I subbed those out and tried them with a much smaller amount of honey and some tapioca starch, and it worked quite nicely. I like the flavour of this pudding with the cinnamon and vanilla, but I do think that next time I'll try it without them to get more of the watermelon flavour. Yeah, the lighting in the kitchen makes this look more orange than it really is! Straining after blending is important to remove any stray seeds or, in this case, bits of beets! That little black speck is a ground seed. That's why it's important to strain! 1.Peel and de-seed watermelon. (Save the rind for Watermelon Rind Soup). 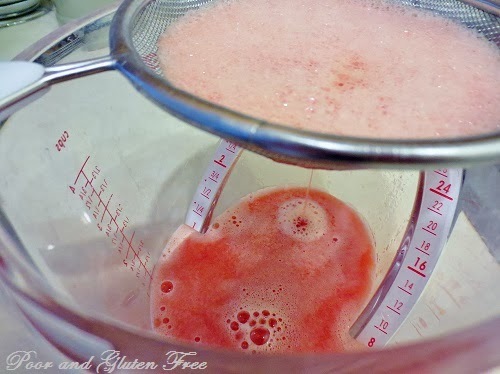 In a blender, food processor, or using a hand blender, blend watermelon until smooth. 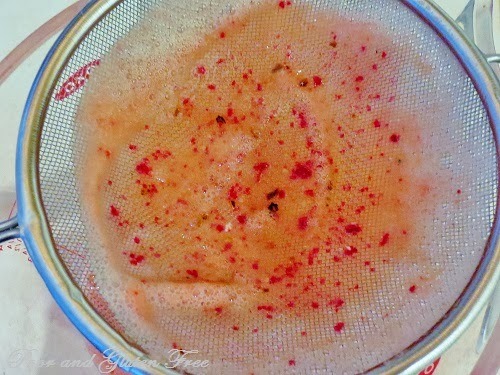 Strain through a fine mesh strainer, flour sac or cheesecloth to remove any seeds or hard bits. This might seem unnecessary, but trust me, you'll almost always miss a seed or two! 2. Reserve 1/4 c puree (sorry, typo fix) Whisk 2 Tbsp cold water with the tapioca starch and cinnamon until smooth. 3. In a medium-sized pot, heat the 1.5 c watermelon over medium-high heat. Bring watermelon to a boil and whisk in honey. Cook for 10 minutes. Whisk in the tapioca-water mix, reduce heat to simmer, and stir constantly until thickened, about 8 minutes. 4. Remove from heat, whisk in vanilla and pour into pudding containers. Chill for 1-2 hours before serving. Garnish with cinnamon, chocolate flakes, ground pistachios or whipped cream. Have you ever tried watermelon pudding? 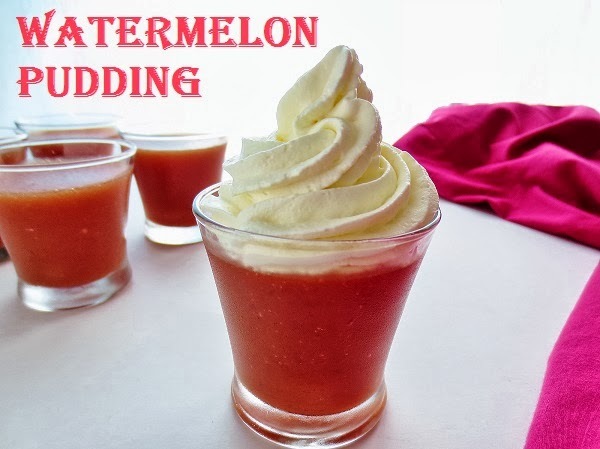 I've never tried watermelon pudding, but now I am interested! 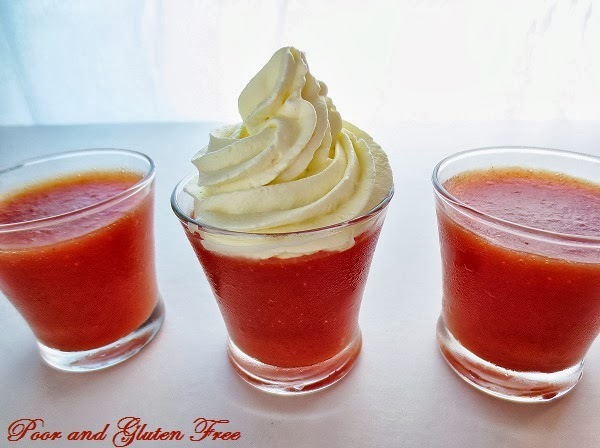 Now I'm going to be scouring the stores for watermelon, because I HAVE to make this. you are so resourceful to color with beets--I love it! Thanks! A little bit of beet goes a looong way to colour food. I use it to make pink icing, too, for my beet chocolate chip cupcakes ;) If you try the watermelon pudding, I'd love to hear what you think of it! Oral Allergy Syndrome, who knew? I've had it for 40 years now, only recently found out there were others out there like me. I get itchy throat from cucurbits, mangoes, bananas, strawberries, even almonds, seems to go in cycles, maybe when airborne allergies are worst? I'm even itching a little from raw milk the pay few days, wonder what the cows are eating? I've never seen a yellow watermelon before! I love how you coloured it naturally. Your Watermelon Pudding looks wonderful - so pretty and so delicious! Yahoooooo!!! I have the same allergy and haven't eaten watermelon in YEARS!! I never realized you could cook them! THANKS FOR THE RECIPE!! Hi Jordie, you're right, you definitely could use gelatine. I didn't because I don't eat red meat and don't keep vegan gelatine handy, but for those who do it's a good option. The texture would probably be better with gelatine, too.